The latest new feature from Twitter, which just began to roll out a few hours ago, is similar to Facebook’s ‘friends suggestions’ appearing on users’ homepages. Twitter is now offering personalized suggestion for users to introduce them to other users who follow your followers or who follow the same people that you do. 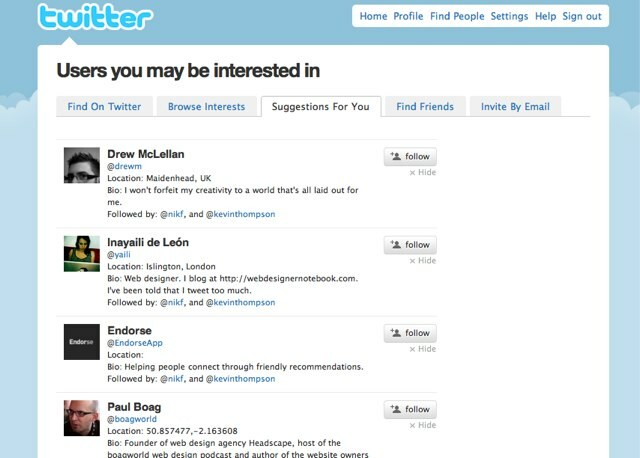 It’s named ‘Suggestions for you’ and you can find the feature under the “Find People” link in the header of Twitter.com. Twitter authorities explained that “the suggestions are based on several factors, including people you follow and the people they follow.” Users will see recommendations while looking at other users’ profiles and soon the feature will be available to developers so the functionality can be included in third-party apps. Twitter has been busy introducing a number of features to its fast growing users worldwide and recently introduced ‘people results’ which show up with every keyword search results and make it easy to find and discover more interesting users to follow. Twitter has seen massive growth in the last year, to the extent of alarming Mark Zuckerberg who still owns the world’s biggest social network with more than 500 million users. Introducing new and interesting features that users like and are addicted to on other social networks is a smart move and a sure way to lure and keep new users.